← Pasadena Playhouse & L.A. Female Playwrights Initiative & ME! My dad had a devastating flood at his house. Apparently the toilet in the front bathroom (which had become something of a pain in the past decade) overflowed. And kept flowing. All night. When he got up at 4 in the morning, there was 2 to 3 inches of water in his bathroom. The living room was flooded. Hallway. My old bedroom. Parts of his bedroom. Parts of the den. People came out to cut carpet away and set up dehumidifiers. They were without water for a couple of days. 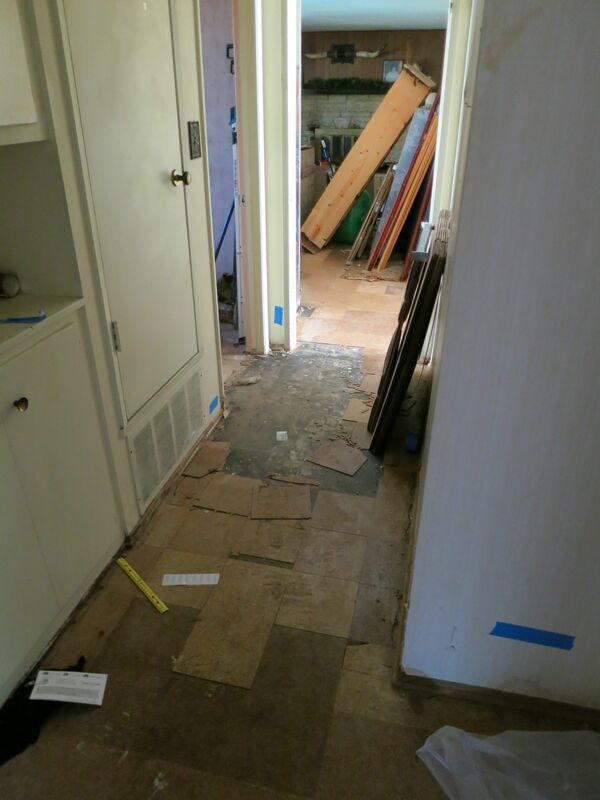 When the insurance company folks came out, they said the tile under the carpet had to go as well. The tile? Asbestos. Yep. So now my dad can’t even live in the house until all the work is done. 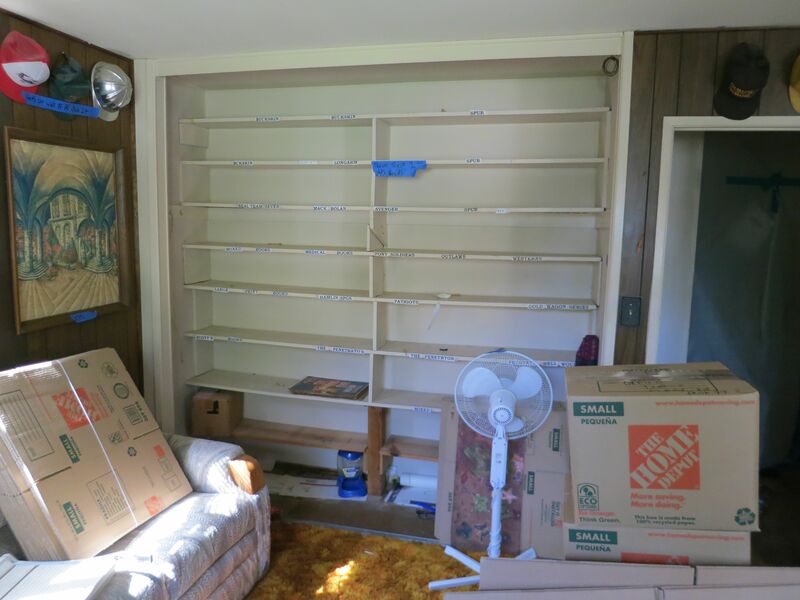 Oh, and the wallboards will have to be replaced, too. Two to three feet up. So he and his caregiver are in a residence hotel about half an hour away from his house while the work goes on. My brother was there this past weekend, and took some photos. 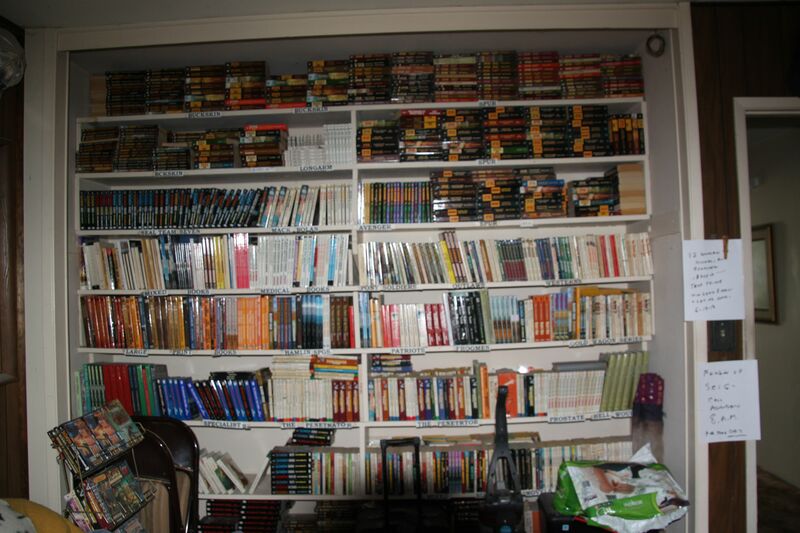 The closet where dad stores copies of his books. Yes, those are all his. 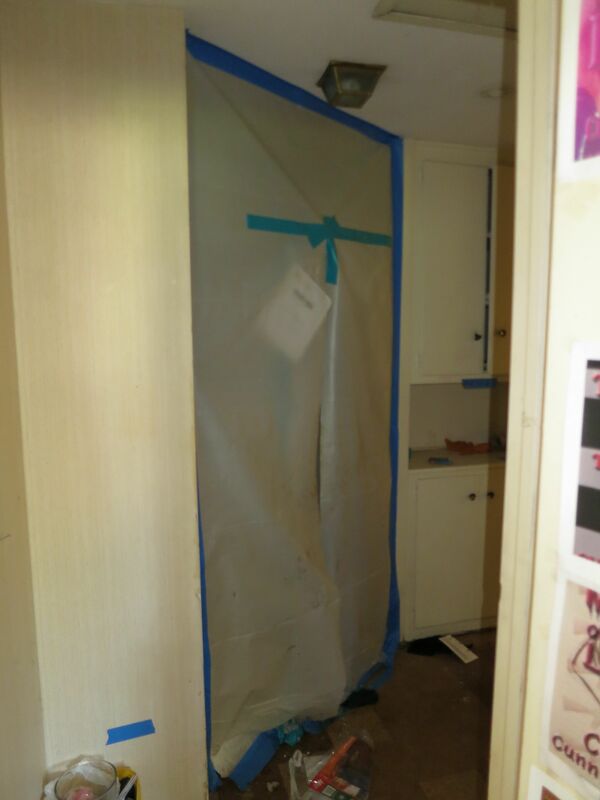 My room and the master bedroom sealed off due to asbestos floor tile. One more – the hallway looking into the living room. Everything changes. Even the house I grew up in. The last time I was down there, in May, I had taken tons of photos of the house – the photo wall, the kitchen, the garden, everything. 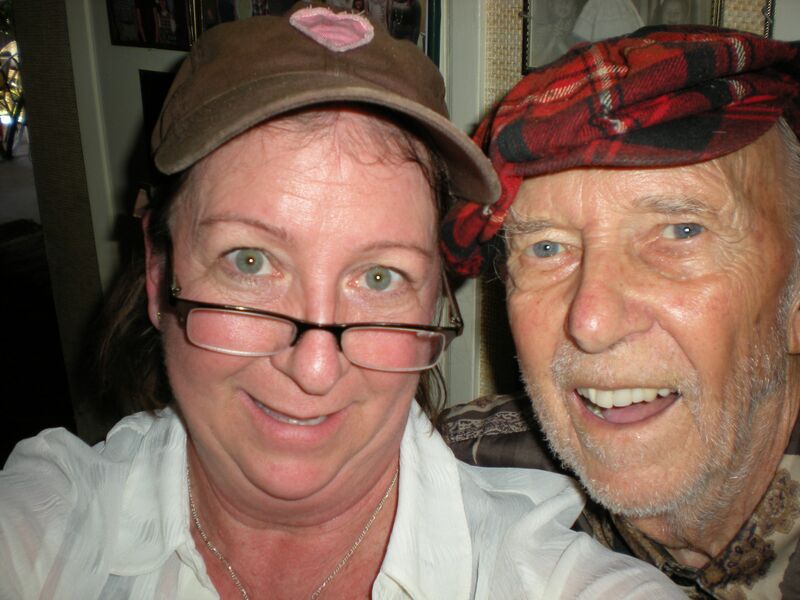 Except when I got home, only two shots – of me and dad – had actually registered on the camera. 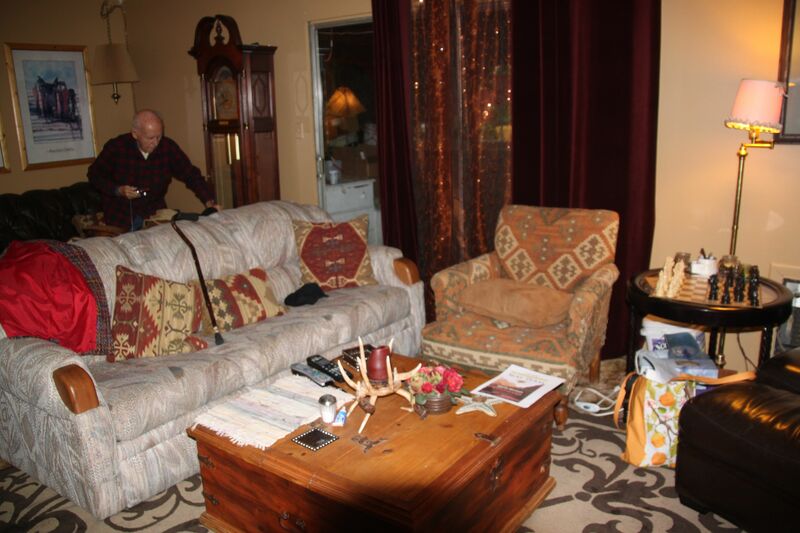 Here’s hoping the magic folks who are packing up my dad’s house and doing all the work it will take to make it habitable again do an amazing job, and that my dad is back in his home very soon. Oh, and by the way – this is a public service announcement. If you don’t have homeowner’s insurance, OR renter’s insurance, get some. Trust me, it’s not money wasted. My dad has a $500 deductible which I’m sure has already been spent. Insurance is taking care of the rest. Happy Monday. Count your blessings! This entry was posted in Life, Observations and tagged changes, childhood home, Christine Ashworth, Dad, flood. Bookmark the permalink. Oh Christine, I feel your pain, (and your dad’s pain). My mom’s house flooded a few years ago during rains due to a clogged outside drain. Same deal…everything had to come up. 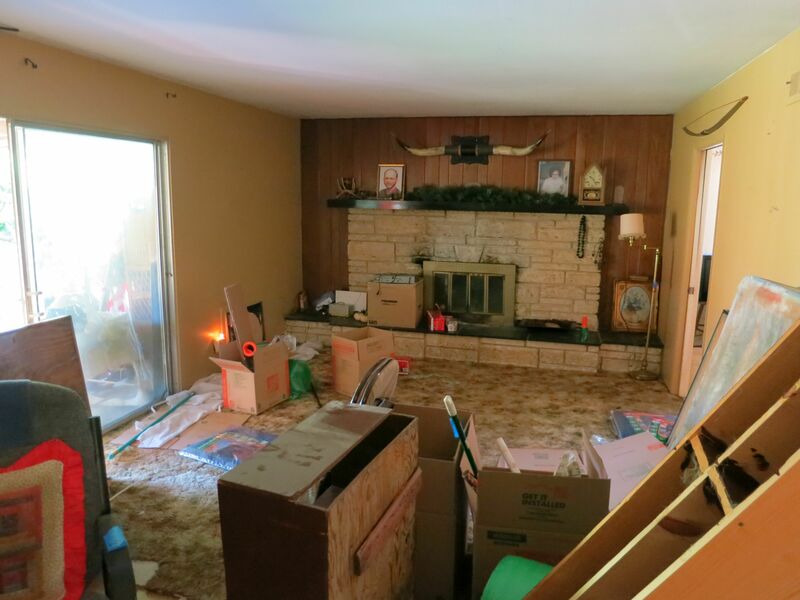 Carpet, baseboards–they had to take it down to the cement and start again. I hope the experts put your dad’s house good as new quickly! Thanks, Sam. It’s just a mess. It would be easier if my Dad weren’t 85, you know? I’m so sorry – that’s got to be devastating… I’m glad there’s a light at the end of the tunnel, though. Your comment about renter’s insurance hits home for me, but unfortunately, because I live in a mobile home (on a foundation) on land, it isn’t available. I get anxious during fire season because I can’t get it to cover my antiques, my looms (which are no longer made, so irreplacable), all the spinning wheels… I have an evacuation plan, but it covers mostly the animals, the computer and clothes. It’s great that your dad still lives on his own. Most people in our parent’s age group aren’t. That’s a blessing. Hon, surely you can get content insurance? Something? I know you probably have checked and double checked, but please check again. Those looms alone are important, much less the rest of your things! Hugs! I remember when your mom and dad had that fireplace put in. Don’t remember the year but I do remember it was before 1970. How lovely that the photo that registered was the one of you and your dad. In the end, the only thing that matters. Wishing your Dad all the best as he gets back into his spiffy new digs…and thanks for the reminder on the insurance! Sorry to hear this. What a nightmare for your dad, but it sounds like it’s being sorted. It is, Emma – both a nightmare and being sorted. He’s hanging in there, though. I’m so sorry to hear this, Christine. I’m glad your dad was able to save the most important things. And yes, good thing he had insurance. I hope it all goes swiftly and that he is soon back in his new but old house.